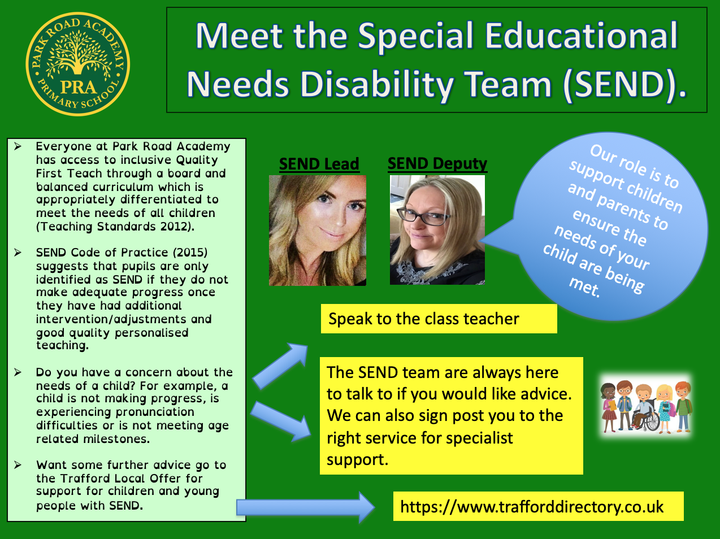 At Park Road Academy, our Special Educational Needs Co-ordinator (SENCO) is Mrs L Taylor (Maternity Cover). Find out what is on offer in your local area for a child or young person with special educational needs or who are disabled (SEND) and their families. Introduction video produced by Aside Media Productions, with huge thanks from Trafford Family Information Service (FIS). Find out what is on offer in your local area for a child or young person with special educational needs or who are disabled (SEND) and their families. Video aimed at parent carers, produced by Aside Media Productions, with huge thanks from Trafford Family Information Service (FIS). Find out what is on offer in your local area if you are a young person with special educational needs or who are disabled (SEND). Video aimed at young people living in Trafford produced by Aside Media Productions, with huge thanks from Trafford Family Information Service (FIS).